"Justice League: Gods and Monsters," is another entry in the popular series of DC Universe Animated Original Movies. All-New DC Universe Original Movie features distinctly different Superman, Batman & Wonder Woman. Warner Bros. Home Entertainment, Warner Bros Animation and DC Entertainment present an all-new animated feature film from the innovative vision of renowned producer and animator Bruce Timm, Justice League: Gods & Monsters, on July 28, 2015. The DC Universe Original Movie, which will include never-before-seen bonus content, will be available on Blu-Ray Deluxe Edition, Blu-Ray Combo Pack, DVD and Digital HD. Witness a divergent reality where the Justice League protects the planet - but answers to no one but themselves. Employing methods of intimidation and fear, this Superman, Batman and Wonder Woman deal brute force in the name of justice. From the creative genius of executive producer Bruce Timm and co-producer Alan Burnett comes an original story where the world's greatest triumvirate of super heroes has distinctly different origins. Superman was not raised by the Kents in Smallville, the Caped Crusader is not Bruce Wayne, and Wonder Woman is not an Amazon warrior of Themyscira. They are as likely the world's saviors as Earth's despotic rulers. When a group of famed scientists experience untimely "accidents," a government task force follows the trail of clues to the Justice League - but is there a more powerful player operating from the shadows? It's a high stakes game of intrigue, mystery and action that asks the question: How do you serve justice to those above the law? Sam Liu (Batman: Year One) directed Justice League: Gods & Monsters from an original story by Bruce Timm (Batman: The Dark Knight Returns) and Co-Producer Alan Burnett (The Batman), who also wrote the screenplay. Executive Producers are Sam Register and Bruce Timm. Benjamin Melniker and Michael Uslan are Co-Executive Producers. 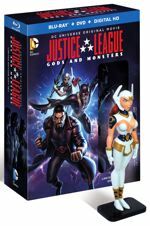 Justice League: Gods & Monsters will be available on Blu-ray Deluxe Edition for $29.96 SRP, Blu-ray Combo Pack for $24.98 SRP and on DVD for $19.98 SRP. The Blu-ray Combo Pack includes a digital version of the movie on Digital HD with UltraViolet. The Blu-ray Deluxe Edition will include the Blu-Ray Combo Pack, along with an exclusive Wonder Woman figurine in a numbered limited edition gift set. Fans can also own Justice League: Gods & Monsters in Digital HD on July 28 via purchase from digital retailers. "We are thrilled to announce this new and totally unique DC Universe Original Movie," said Mary Ellen Thomas, Warner Bros. Home Entertainment Vice President, Family & Animation Marketing. "With Bruce Timm presenting his distinctive take on the alternate universe of Justice League: Gods & Monsters, we know fans will be gripped by the plot twists and the question of whether we are dealing with heroes or villains." CALCULATED RISKS: The Making of Gods and Monsters - Justice League: Gods & Monsters was an idea that pushed the boundaries. It began with that challenging question writers face: "What haven't we seen before?" Bruce Timm and Alan Burnett audaciously answered that challenge, resulting in a fresh and exciting film that forces us to think differently about the DC Universe. The New Gods - Encore presentation of 2010 documentary about Jack Kirby's New Gods. A Sneak Peak at DC Universe's Next Animated Movie - An advance look at the next DC Universe Original Movie. Justice League: Gods & Monsters will be available for streaming and download to watch anywhere in high definition and standard definition on fans' favorite devices from select digital retailers including Amazon, CinemaNow, Flixster, iTunes, PlayStation, Vudu, Xbox and others. Starting July 28, Justice League: Gods & Monsters will also be available digitally on Video On Demand services from cable and satellite providers, and on select gaming consoles. 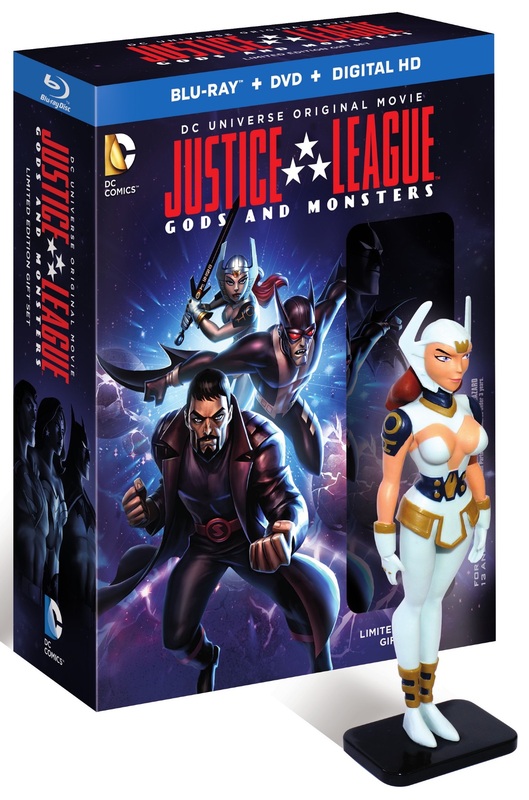 Order the "Justice League: Gods and Monsters" animated movie on Blu-ray or DVD from our Online Store. Also below are a few new images from the film. 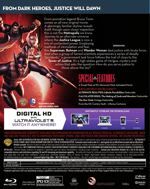 Warner Bros. Home Entertainment (WBHE) has released the back cover artwork for the Blu-ray and DVD versions of their upcoming DC Universe Original Movie, "Justice League: Gods & Monsters". "Justice League: Gods and Monsters Chronicles"
Machinima has released all 3 episodes of "Justice League: Gods and Monsters Chronicles" online via YouTube. 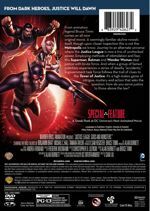 The "Justice League: Gods and Monsters Chronicles" series is based on "Justice League: Gods and Monsters". In the second episode titled "Bomb", where Superman is the son of General Zod, President Amanda Waller turns to the man of steel when a weapon malfunctions and threatens to destroy a city. That weapon's name... is Brainiac. In the third and final episode titled "Big", Wonder Woman (who is actually the New God Bekka, the warrior goddess) must take on a horde of Kobra soldiers to save her friend with benefits, Steve Trevor.